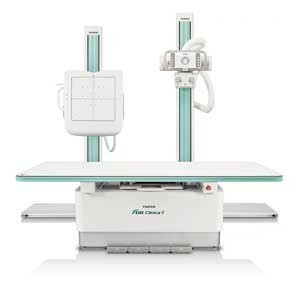 FDR Clinica - A high-quality x-ray solution that delivers a user-friendly, smart workflow for busy imaging professionals. FDR Clinica has all the advanced features you need to enhance workflow and improve the patient experience. Fujifilm’s renowned digital image processing expertise, including Dynamic Visualization, optimizes image display based on recognition of contrast levels throughout the entire exposure field. The resulting first-up images have outstanding detail and greater window and leveling capability in PACS. *Based on higher MTF and DQE demonstrated in Sato K, et al., Effect of X-ray incident direction and scintillator layer design on image quality of indirect conversion flat-panel detector with GOS phosphor. Capacity Assisted Generator - perfect for the medium sized xray department. No power supply modification necessary. 40kW Single Phase Input power 3kW. Line Powered Generator - Can handle the rigorous workload of a large facility with Three Phase Input power and several power ratings from which to choose: 40, 52, 68 kW. Inherent Filtration: Min. 2.0mmAl eq. Both tables accomodate a maximum patient weight of 600 lbs. FDR D-EVO II Cesium and Gadolinium models. FDR ES C35 14x17 and C43 17x17 Cesium models. FDR ES G35 14x17 and G43 17x17 Gadolinium models.